"The Waitemata Hunt began in 1949 with a paperchase. It was in Riverleigh Road with Vern Rope who became Waitemata's first Huntsman" says Don Nash who was the first Master, and Patron up until his passing in 2009. These days the Waitemata Hunt has an active membership of hunting enthusiasts, who enjoy the long standing traditions associated with hunting to hounds. The Hunt owns a property, complete with hound kennels, which the Huntsman manages and maintains. Keeping hounds fed, fit and educated requires significant commitment and investment. If you have never ridden to hounds before, those antique hunt prints that have adorned walls throughout history are about to take on a whole new meaning. For most people, a brisk morning, fresh horses, and baying hounds are indeed a life-changing experience. We hope it will be for you. Stand forewarned, however, no matter what your riding discipline, it can become addictive. 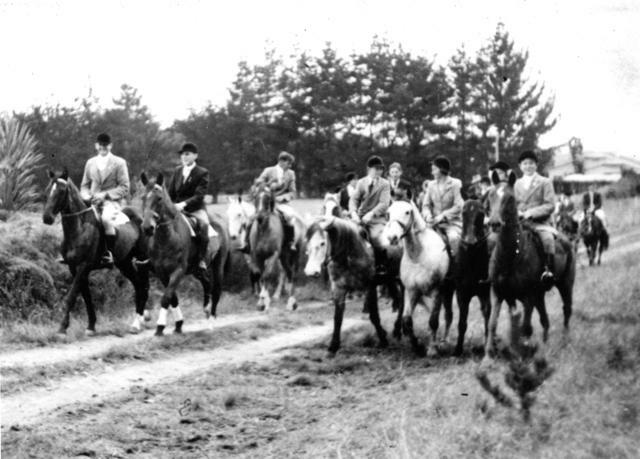 The Waitemata Hunt Incorporated has been continuing the proud tradition of hunting to hounds in the North Auckland region of New Zealand for over fifty years. Hunting to Hounds is a challenging, exciting and enjoyable non competitive sport for all ages from 8 to 80!!! The hunting season is here, if you would like to join us for a day out at one of our organised rides please contact us to get all the information you require to begin your Waitemata Hunt experience.